Help make the Tribunal possible with your donations! Our association is an accredited non-profit organization, donation receipts are tax deductible. Name of association: Lückenlos e.V. Here you can find materials and flyers to download. Order and distribute our materials and flyers in your city/at your event! Write to koeln [at] nsu-tribunal.de! … the victims of the NSU murder series and attacks. … in outrage the lack of systematic investigation into the murders. … the racist violence in Germany and the perpetrators of this violence. … a better life for all people. Calling out racism is the first step to overcoming it. We include texts of accusation by various individuals and groups in our call who have formulated their respective perspectives on the NSU-Complex and racism. We are documenting them here and they will be included in the Tribunal’s accusation. We accuse, stand in solidarity, refuse and resist as members of the post-migrant society, as Jews in Germany, as editor kollektive of the magazine Jalta – Positions on the Jewish Present.We indict the acts of the NSU. We indict the refusal of the German authorities to clarify and resolve the crimes. We indict the racist treatment of the victims and members during investigations and beyond. We indict the society with its deeply rooted racism, and we indict its indifference. We indict how the racist background and motivation of the murder series have been made to disappear . We indict how those affected and hurt by racism have been made invisible. We indict the racism inside the Jewish community in Germany. We stand in solidarity with victims of the NSU and their relatives, with those affected and hurt by racism, with all people who are working to change present-day society, with those who are shaping the society of many. As Jews in Germany we are often awarded the power to define, as long as we stick to our appointed roles and hold up the established narrative: in remembrance of the Shoah, as prosecutors of anti-Semitism (as long as it's not that of the 'German' society), as pugnacious Jews who the liberal German society can embellish itself. We refuse to accept and play by these rules. The white, German majority society projects and imposes images of what it means to be us. We oppose and struggle against this foreign control that tries to prevent us from deciding and determining our own position as political activists. Ourselves. We oppose and struggle against the competition of victims that that weighs up racism against anti-Semitism. This competition is put to us but likewise exists within the Jewish community. We won't allow one minority to be pitted against another. Instead we stand ready as allies with those affected and hurt, marginalized groups and all others who stand in solidarity. Instead we experiment with new ways of how we can position ourselves in solidarity. Instead we are opening up spaces for conflicts conducted in a different manner. Instead we are looking for new alliances. You can get in touch with us at jalta@neofelis.de. Lea Wohl von Haselberg and Hannah Peaceman are offering a workshop on “The NSU and Anti-Semitism – an analysis of media and solidarity” during the NSU Tribunal in Cologne. We accuse those who contributed to creating a nationalist mood in the 90's, those who made young people believe they would serve the 'German Volk' by committing racist acts of terror. We accuse those who did not see caring for the victims as a priority, and who, under the cover of carrying out necessary investigations, let loose a wave of investigative terror on the victims, on the back of the wave of racist terror attacks. Without cause they knowingly and intentionally caused the victims and their relatives wounds in addition to those inflicted by the NSU-terror. We accuse those who resist against making public the institutionalised racism of their agency, as they are resisting what would massively contribute to push back racism in our country. We accuse those who , rather than accusing the Secret Service of the Interior of supporting and stopping the non-persecution of NSU-terrorists, affirmed and strengthened it. We accuse those who took part in the proactive discrimination of young migrants after New Year's Eve 2015, thereby urging on a public racist mindset. We accuse those who formed a racist motivated kettle for young migrant men on New Year's Eve 2016, thereby handing the racist mob the exact same point of attack that is characteristic of investigations into the NSU: Treating migrants as potential criminals. We are leading this charge with due reason: The authorities of a country like ours, with its colonial and fascist past, have all reason and duty to prosecute the racist and unequal treatment of people in order to create and hold upright an atmosphere characterised by democracy and equality. that, in future, we focus more on standing in solidarity with, and are able to see, the perspectives of people with migratory backgrounds. We indict, indeed condemn! … the repeated failure of authorities to identify and investigate evidence suggesting the racist background of the murder and attack series by the so-called NSU. We indict... the missing confrontation with facts when evidence clearly indicates the existence of institutional racism within the German prosecution authorities. We demand... a completely independent and public study of the investigations of the murder and attack series by the so-called NSU. We demand... independent complaint offices against police both on national and federal level. We request... that racial profiling stops to be part of police practices. We demand... that all those who have been entrusted with political responsibility realise the imperative to resolutely stand up against racist prejudices in state institutions and society as a whole. Racist-motivated violence is an urgent and genuine problem. It needs to be recognised and fought against as such. More than five years have passed since the series of murders and bomb attacks by the extreme right-wing terror network “National socialist Underground” (NSU) was uncovered. During this time journalists, writers, investigative committees and anti-racist initiatives continued to examine the NSU-complex from various political perspectives. The NSU court case in Munich has so far lasted for four years and is still ongoing. After all of this time and work we know that the NSU was anything but an isolated group of three people. Rather, it was made up of a network of dozens of people who were or are active in various militant Neo-Nazi movements. We know that the NSU needs to be held accountable for at least fifteen coward murders across Germany, two bomb attacks in Cologne, an additional bomb and fifteen incidents of robbery. We are aware that racist and extreme right-wing terror in Germany did not establish itself in overnight. There were continuities, discontinuities and peaks throughout the post-war period. What we are focusing on is the racism and racist practices at the centre of society which presently provide a fertile breeding ground for right-wing populism and extremism. This is not least made evident by the daunting debates on refugees. What is true is that the promise given by Chancellor Angela Merkel to completely resolve the NSU-complex is nowhere near to being kept. How is it possible for a trio to commit all of these murders, bomb attacks and hold-ups over a period of 14 years while living in the underground without security services of the state being alerted? The further you go within the world of the NSU the more complex and confusing the backgrounds and links become and the dealings of the 'deep state' or 'derin devlet' are made apparent. The deep traces left by racist violence and right-wing terror at the hands of neo-Nazis is made equally apparent. Due to a mixture of ignorance, failure, trivialisation and covering-up by authorities, the judiciary and state apparatus, anger is joined by consternation on the fifth anniversary of uncovering the NSU-murders. We cannot overlook a break in trust with these institutions that has initiated all of society to start thinking. But what about anger and resistance? You had to look extremely hard for resistance and solidarity from within society as a whole when, a couple of years prior to the uncovering of the NSU, a couple of thousands of people – the majority of them migrants, entered the streets under the motto “No 10th victim”, calling to the national government to resolve the series of racist murders. What happened to the responsibility society could have taken as a whole? After more than five years of examining the NSU-complex we are in need of critical confrontation with racism and racist practices within this society more than ever before. We require a broad societal alliance which can assume responsibility, commemorates the victims of racist and extreme right-wing violence and organises part of the resistance against the racist and extreme right-wing consistencies. 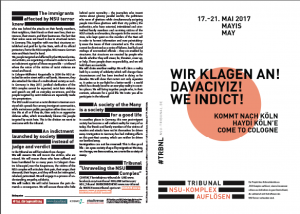 This is why I believe it is important to actively support the nationwide NSU-Tribunal that is being planned in Cologne from May 17th to 21st 2017, as to activate and become part of resistance from within society. The Tribunal will be a space where victims and those affected and hurt by racist violence, initiatives, alliances, groups of artists and youth organisations, a.o. receive a platform to critically examine the NSU-complex and racist consistencies. Together we want to set a sign for immediately resolving the NSU-complex. Germany is a country of rule and law, it is a welfare state and democracy. No racist murders ever again! Complete resolving of the NSU-complex and its crimes! I indict! I indict the authorities of the investigative authorities who put the relatives of nver Şimşek, ­Abdurrahim Özüdoğru, Süleyman Taşköprü, Habil Kılıç, Mehmet Turgut, İsmail Yaşar, Theodoros Boulgarides, ­Mehmet Kubaşık und Halit Yozgat under pressure, accused and criminalised them over a period of years. To this day they work on masking the knowledge of the relatives of the victims and survivors of the bomb attacks, trying to keep it silent. The world of the investigators consisted of phantasms. For example, they used the photograph of a blond woman to prove the thought-up double-life of their murdered husbands to three widows. How did the photograph travel from one officer to the next?`How was the photograph passed on to formulate the exact same suspicion time and time again? The racist investigations were followed by racist reports in the media. I indict, as the pain I feel is great and the acts of those who enabled the NSU-complex cannot be forgotten. I indict! Every day I try to convince children and young people in school that it is important to be have a correct and respectful manner, to take responsibility for yourself and your surroundings, to show empathy and listen to others. The NSU-complex showed that all of what we try to teach our children is by no means obvious or taken for granted, but needs to be demanded again and again. The relatives of the NSU-victims were wounded by mocking reports in the media and racist conduct of authorities. The residents of Keupstraße new that they had been attacked by Nazis, but no one wanted to recognise this. Otherwise the terror series might have been resolved some time ago. But also later, at the court case on the NSU in Munich, no one took responsibility. The demands and charges of those affected and hurt, the families of the victims, were ignored. No attention was paid to them. Now we have the duty to take responsibility and stand at their side. The Tribunal is a place where we can demonstrate to children and young people that we demand and live our shared values of respect and sincerity. And the first step to accomplish that is: to listen. I indict because I am not certain wehther Germany is still the secure and safe country for migrants that it appeared to be. Until the point when the extreme right-wing terror cell NSU was uncovered I was convinced that there was no place for racism and nationalism in Germany. Didn't the country examine its history in earnest? I believed that the gruesome atrocities of a few fascists were the barely effective left-overs of a spirit of destruction from NS-history. For me, reappraisal of the country's past was not solely restricted to the engagement of a small group, but an event that was taking place throughout society. This process of change gave me hope and made it possible for me to identify with this new set of principles. The time after the NSU-terror-cell had been uncovered was terrible for me, as I saw the culture of commemoration erased completely. I was appalled when I found out that the state's security authorities play their part in this complex. The past will not disappear. Reappraisal of NS-history is not completed. It is an ongoing process. We indict! The field of what is visible appears to be marked out: Media are reporting on the crimes of the NSU, with a biased focus on the perpetrators. Those who were targeted and continue to be affected by the NSU murders and attacks have been and continue to be faded out of focus. Instead, racist stereotypes are perpetuated. Within investigating authorities these are amplified through apathy and ignorance. We indict this field of what is visible, where structural and institutional racism serve the NSU-terror as accomplices. We want to break open this contracted and encrusted perspective. We want to question and shift it, to jolt, betray and sabotage it to start a broad debate within society that has been absent and missing until now. We are a society of many and demand to resolve the structures and conditions that enabled the existence of the NSU. We demand to do this together with those affected and hurt by the NSU, on the grounds of their knowledge and experiences. from this state and its institutions! - the inconceivable harm done to their families, relatives and friends. We stand in solidarity with the relatives and the victims who survived. We stand hand in hand, at their side. With all workers and oppressed of this society. Their wealth lies in their diversity. We mourn the fact that the majority of society, almost all left-wing organisations including us, did not hear the voices of the relatives in Kassel and Dortmund in 2006 and did not recognise the dimensions of the NSU. - institutional and structural racism, growing fascism. All of those are instruments to separate us working people inTO 'you' and 'us' in 'Germans' and 'the others'. Chains with which we are shackled to the system. They are all instruments to enforce imperialistic power interests. To keep the masses quiet on the inside and wage war on the outside as is being done in Afghanistan, in Syria. Ownership status, maintaining the wealth within a handfull of ruling individuals, waging wars over resources and spheres of influence, stirring up hatred within countries and among people and committing racist murders. Those are the pillars with which the exploitative society supports its rule! This is how the peaceful co-habitation of people in this country and on this planet is constantly being thwarted. In our single world of migration that has long since become a melting-pot of people from all continents in their variety and difference, with their peculiarities and things they have in common. - to break the silence! Victims, those affected and hurt by the NSU crimes stand at the centre. To root their names and stories within our collective memory. To respect their wishes for commemoration and places of remembrance! Moral and political recognition of their suffering. Financial compensation for the victims and their relatives. - Resolving the crimes and clarifying the circumstances surrounding the NSU-complex, with all consequences. - Prohibition of all fascist networks, and any racist-populist propaganda! - Racism and fascism are not opinions but crimes. - Perpetrators within institutions have names – prosecute them! These reforms are necessary changes to constituent aspects of the situation. We are aware that they won't change anything in the big picture. Reforms, flowers on the chains … this is about revolutionising the fundamental principles of society. A socialist society where the many, the oppressed, disenfranchised, ostracised, demeaned, and exploited can start a new, good life. The initiative ‘Unraveling the NSU Complex’ would not have been possible without the dedication and commitment of all the wonderful humans that have invested countless hours to keep the movement alive and rolling: planning; debating; performing; accounting; crowdfunding; financing; marketing; writing; filming; photographing; documenting; networking; supporting; remembering; researching; organising — and much more. A big THANK YOU goes out to every single one of you. Those affected and targeted by the NSU terrorism deserve a special mention — for their courage and strength to mourn, lament and demand together.